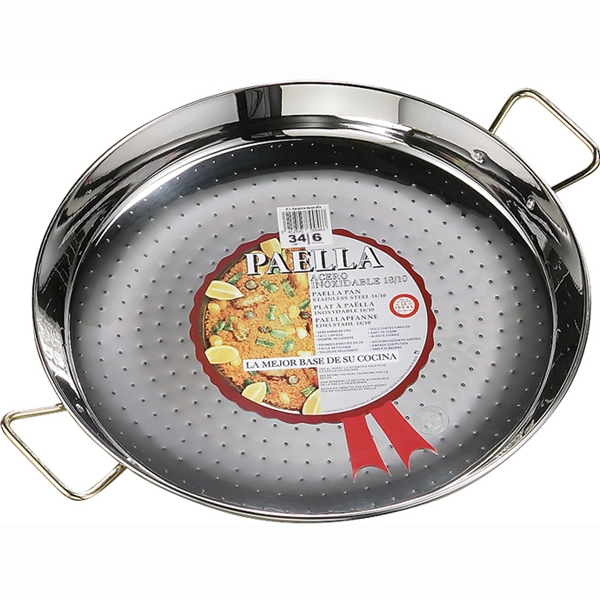 Imported from Spain, these paella pans are made from high-quality 18/8 stainless steel. The traditional steel paella pans have been used by Spaniards for centuries because their shallow, sloping sides cause the rice to cook evenly and develop a more intense flavors. The stainless steel quality prevents from rusting and discoloration that may occur with the carbon steel pans. The pan is thin but quite rigid and durable with a hammered dimpled bottom which distributes heat evenly and quickly while also giving it a beautiful look. The pan can be used on a stove top, oven, gas barbeque grill or open flame. For best results, it can be used over a paella burner (also available for purchase). As the pans get larger, they grow in diameter rather than depth, which allows for more delicious socarrat, which is the term used in Valencia to describe the delicious caramelized crunchy rice crust which forma the base of any good paella. Never overheat an empty Stainless Steel Paella Pan for too long because continued exposure to high heat can cause a normal discoloration or cause the pan to warp. A Stainless Steel Paella Pan is quite easy to use and maintain, with the advantage over a carbon steel one of not rusting and therefore requiring less care. It can even survive a dishwasher, although it is still better to hand wash them. For everyday cleaning of a Stainless Steel Paella Pan, hand washing in hot, soapy water and drying it thoroughly with a soft cloth before storing is recommended to maintain the best appearance of the Pan. Use nonabrasive pads and stainless steel cleaner to remove discoloration and stains. Do not use abrasive pads and steel brushes as they may scratch the surface. For the occasional dried-on or burnt food, let the Pan soak in warm soapy water for about an hour then use a soft-scrub sponge and dishwashing soap to clean off the residue. Unlike a Carbon Steel Paella Pan, a stainless one does not require any special curing or seasoning. Simply cook in it as you would in any other stainless steel pan.